Sometimes I miss those days while I was in England to study. I went with all the preconcieved notions about the britishers being snoot and England not being so friendly country to be in. But still I made the decision to go there rather than any other country. To be really honest, while I lived there I actually fell in love with country. I found it a bit similar to India. The weather, the food and their accent were the most delightful things. India’s quite diverse in its food culture, Britain is nowhere close but I was still impressed with the diversity they had. Mostly there are more of migrated foreign residents so the restaurant variety was pleasing to see from Thai, Chinese, Portuguese, Lebanese to Korean, American, Japanese etc. Food and the people around always bring warmth. I wonder why Britain is considered to be one of the rude countries or not very friendly. My experience there has always been overwhelming. I love their accent, it’s somewhat like India that the dialect and accent varies as you go from north to south. The people are certainly very helpful and also speak a very polite language. Weather being the most unpredictable was fun to see. The summers were warm and lots of sunshine, an ideal time to hit the beach. On the contrast the winters were dark and gloomy with very little sunshine. However, the fall was usually unpredictable sometimes rainy, sometimes sunny and moments of chilliness. So often we would get drenched in the rain or catch the chilly winds while walking back home. After all that walk in the most unpredictable weather, nothing could beat a home cooked meal. So I often made a bake which wasn’t too difficult and also quick. I visited my aunt while I was studying there and she used to make the most amazing bakes. My fondness for bakes grew even more. 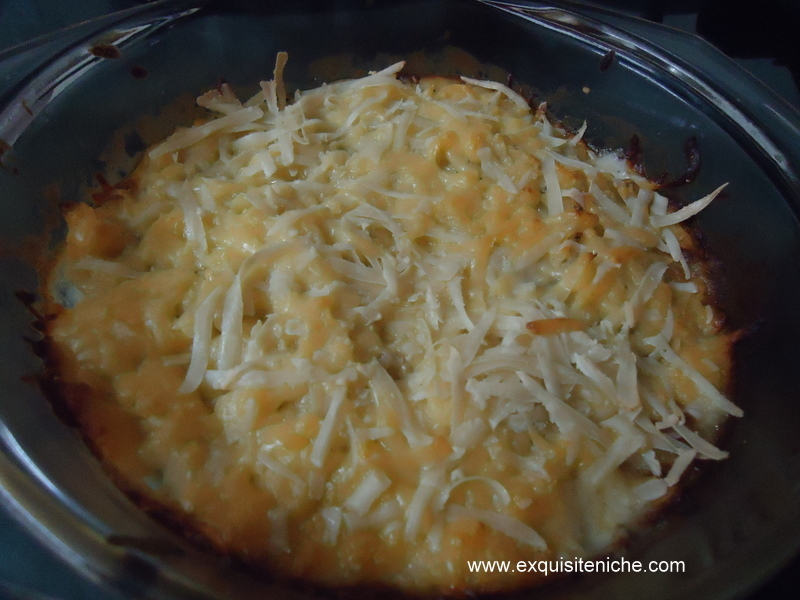 The best she made was a cauliflower and cheese bake. There is alot of creative bakes you can make with alot of combinations of the vegetables. 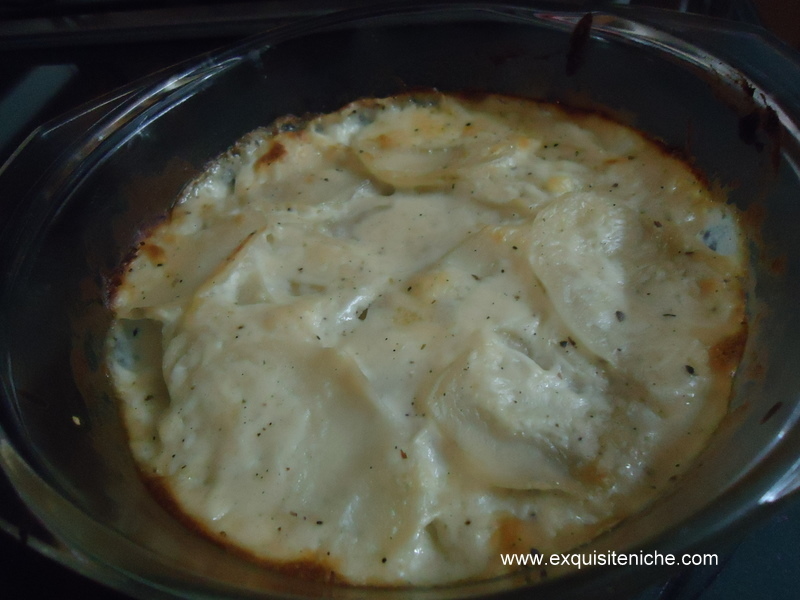 Either you can put all the vegetables or can make specific bake such as broccoli and potato bake, or corns in spinach sauce, or mushroom, corn and zucchini bake. What I mean to tell you is that you can do experiments with all sort of things. There has been a desire to make a nice creamy spinach sauce. I looked around a few recipes but honestly I followed my instincts. When I actually made this recipe I realized my mum used to make chicken balls in spinach sauce which tasted really yum. Maybe it wasn’t a replicate but the bake turned out to be good too. So, at first I washed the spinach thoroughly and shredded it nicely and kept it aside for a while so the water drains out completely. Then, putting a teaspoon of oil in the pan, I put the spinach and cooked on a low flame. I let it wilt. Then, let it cool down and churned it in the grinder. Dont worry about the quantity it will now seem the half of you had initially taken but it is enough to give it a great taste and colour to the dish. Meanwhile, I put some butter with refined flour and some milk to make white sauce. Seasoning is essential in the white sauce, and then put the pureed spinach in the sauce. Let it boil. Add corns to the sauce. 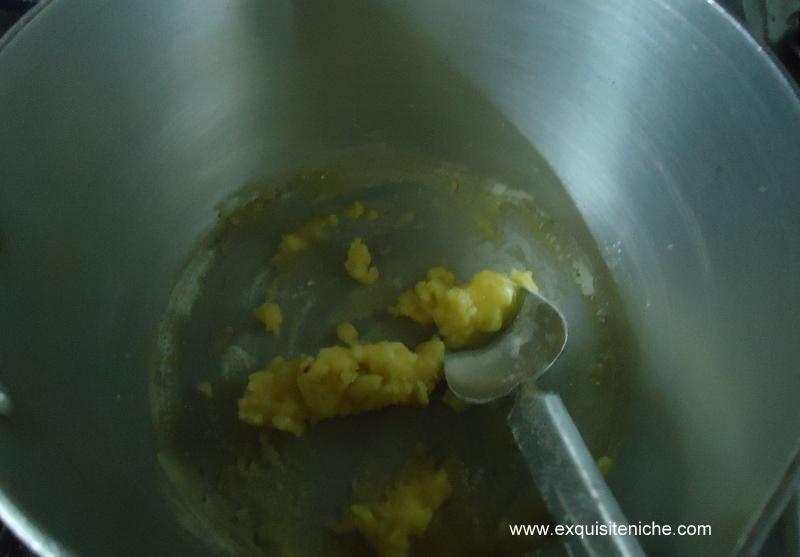 Then simmer for 2 minutes carefully keeping in mind the thick consistency. Mix well and keep aside. Sauté the carrots and beans. Boil the potatoes and keep aside. Now grease an oven proof baking dish. now add the sautéed vegetables, carrots and beans. Throw in the preheated oven 180 degree Celsius for 20 minutes. Eat Hot tastes delicious with garlic bread!! Wash the spinach and drain it well. Pat dry with a kitchen towel. Heat a tsp of vegetable/ canola oil and put in the spinach and let it wilt. Add the garlic. Cool the spinach and grind it in the mixer. Keep aside. Heat butter in a pan, add the flour and the milk. Season it with salt and pepper. Let it boil. Add the spinach. Mix it nicely. Add the corns and the peas. Stir and remove from heat. Preheat the oven at 180 degree Celsius. Boil potatoes and keep aside. Sautee carrots and beans. Keep aside. Grease an oven proof baking dish. Lay the potatoes in the dish, then put a layer of beans and carrots. 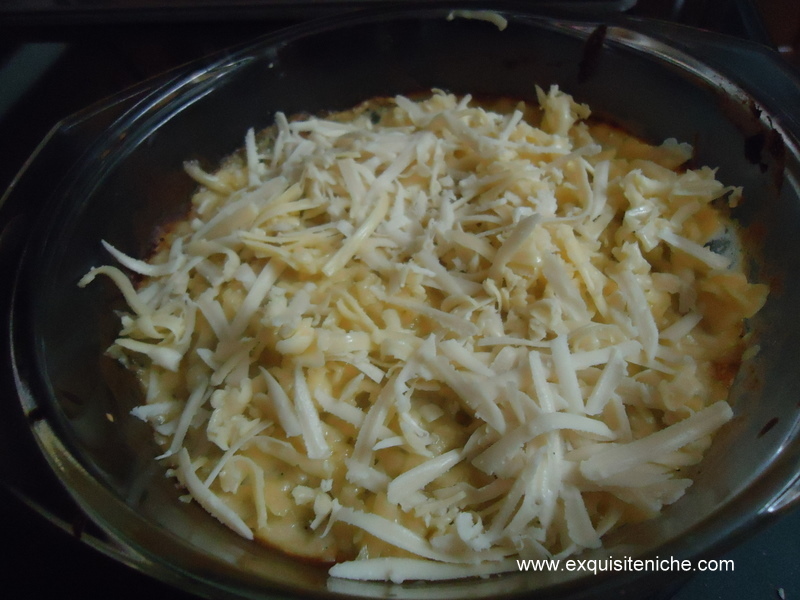 Put some grated cheese and put in the oven at 180 degree Celsius for 20 minutes. I love all the seasons but this time of the year is my favorite; when the summers are going and winters are setting in. The weather in between these seasons is wonderful when there is sprinkle of rain. When the weather is good, a tempting meal is always essential. While I sipped into my tea last evening with this pleasant weather, I wondered what exciting I could make. Nothing could beat a creamy soft chicken, freshly baked in my oven. So I had actually bought mascarpone long time back and had been wondering what savory dish I could make with it. Making tiramisu or a cheesecake is a standard thing to do. But I really wanted to try to be innovative. So trying these flavors with the chicken was a wonderful idea. Also, I added some grilled bell peppers which always go along well with a baked dish. Another wonderful thing about trying this chicken was I didn’t wanted to pan fry or cook it. I wanted to bake it! Let me tell those you haven’t tried baking a chicken, it’s actually the most easy thing to do. So firstly I washed 3-4 pieces of chicken breast…..
Then I mixed the mascarpone cheese, homemade pesto and season it with salt and pepper. Let it rest aside…. Serve oozing hot with some crispy bread…. Preheat the oven to 180 degree celcius/ gas 6. Mix together the pesto and mascarpone. Add salt and pepper to taste. Keep aside. Use a small sharp knife to make a slit along the side of each chicken breast to form a pocket. Fill carefully a quarter of the pesto mixture into each chicken breast pockets. Brush a little oil about 1 tsp all over the chicken breast and season it well with salt, pepper and oregano. Tip the breadcrumbs onto a large plate and season it with salt and pepper. Place each breast on the plate and press all over with the breadcrumbs. Place the chicken and bell peppers in a lighly oiled shallow dish. Drizzle over some remaining oil. Cook in the oven for 20-25 mins until the chicken starts to turn golden ans is cooked through and serve with a crusty bread. Well, I know I have mentioned it earlier that I am actually trying to watch my weight. But its good to indulge once in a while. I couldn’t keep myself to resist my temptation of having the two main components I have used for this recipe. Cheese and Potatoes are one of my staple diets. If you are a big lover of Big Chill, this is something you would have had as a side dish with the grills. They usually offer a very little portion, which leaves me with more craving for it. So I decided to replicate at home. But you know what? It actually turned out to be better than what I had there. This is quick and easy bake which is loved by almost everyone. 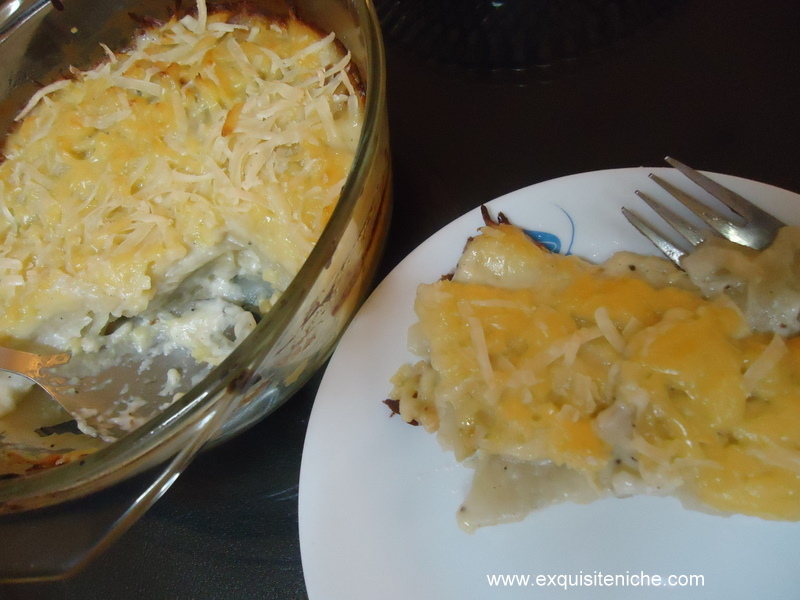 If you love potatoes and cheese this continental dish you would simply adore. This is one of my favourite innovations and something that kids in my family love eating. Heat butter in the pan. Add flour. Stir. Add milk and let it boil. 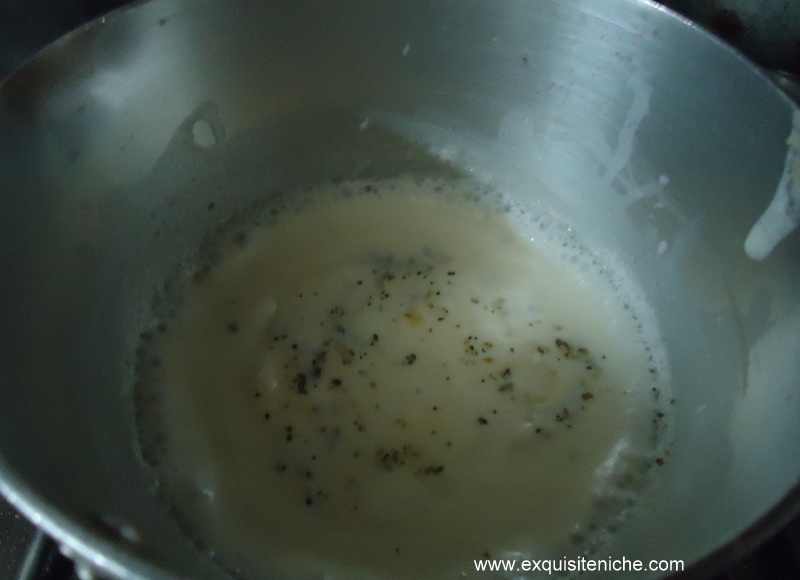 Once it boils, simmer the gas and bring it a thick consistency. Align the sliced potatoes in a baking dish. Put it in the oven for 25 mins at 200 degree Celsius. Bring it out of the oven. It would have turned a little golden. Sprinkle the processed cheese over it. Bake again for 20 mins at 200 degree celsius. Couldn’t resist from taking a picture while I took a bite. Sometimes potatoes are not thinly sliced so it may take more time to cook. But 45 mins is ideal. 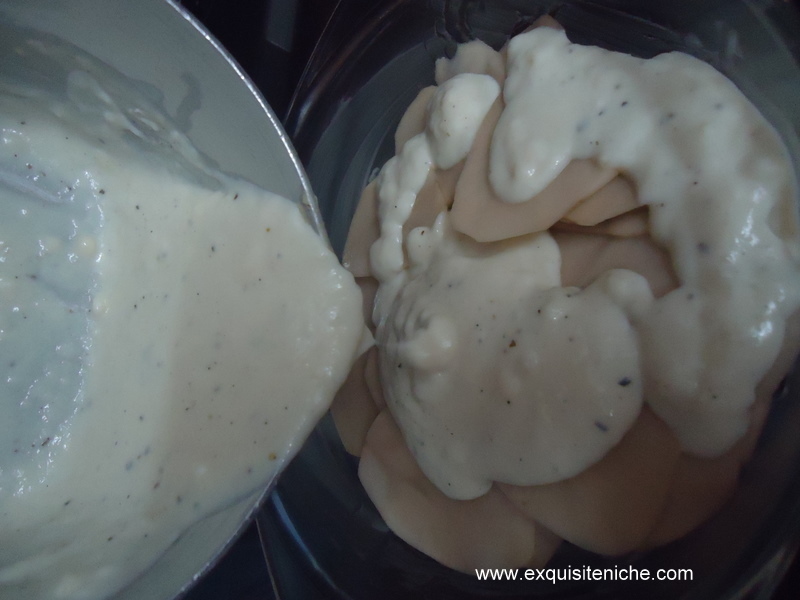 Make sure white sauce is thick enough.